I'm back for more ramblings about myself. Like a tramp muttering about everyone who's wronged him under a motorway overpass. Obviously the big news as the Summer got in full swing was that I went abroad. Only to Belgium, but it counts. I had a slightly disappointing trip on the Eurostar then got all goose bumpy at the Brussels Metro (its logo is still rubbish). In fact, it was a surprisingly busy month all round, as I also visited a village fair, was a gooseberry in Dewsbury, and splurged all over West Yorkshire. Not like that. If I'm honest, I think the heat got to me in August. How else do you explain blogs about my favourite Northern Rail tweeters? About me seeing naked women where they didn't belong? Or posting pictures of myself at 19? Frankly, I was teetering on the edge of sanity, and going off to Humberside clearly didn't help. I quite liked Hull though. Is that further evidence of madness? Clearly I needed a break, so at the end of the month I took myself off to Middlesbrough for another Epic Journey With Little Purpose. I got to follow in the footsteps of Dame Victoria Wood at Battersby Junction, I romped over moors, and I was singularly unimpressed by a trip back in time. The biggest, most important event however was a visit to Redcar British Steel, which I'm still pleased by four months later. Some people want to visit the Taj Mahal or Machu Picchu: I get all excited by an underused halt in the middle of a steelworks. 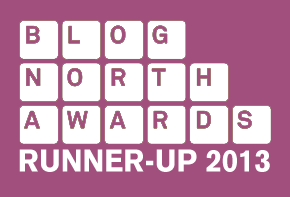 This was the month I came over all Halle Berry, as I was shortlisted for the Blog North Awards. It provoked a mild panic as I realised I'd have to actually do some stuff for the blog, so I ran round Cheshire like an idiot. I was basically whoring for votes. Fat lot of good it did me. I ended up in second place in my category. 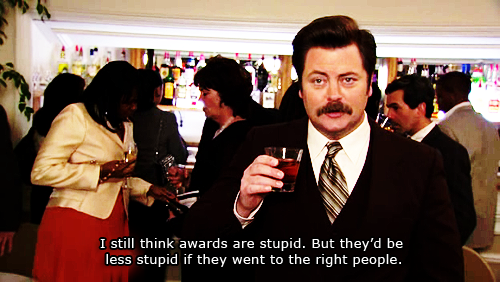 I'm going to let Ron Swanson speak for me, because he is always correct. Incidentally, did I mention I'm up for another one? There's a subtle link in the top right corner. I don't have very high expectations for this one, because it's a national award and this blog is pretty niche, but all support is much appreciated. Still, it got me in the Guardian (or rather, a suggestion from the lovely Carrie did) next to a bunch of other weirdos. Plus Jamie got me in the Wirral Globe. I don't think I got many blog hits from my sudden media fame, but it was all very exciting. And I got to go to Stalybridge with Ian and Manchester United Football Ground (just the station, mind) with Robert. Definitely a high point for the year. I purged a few demons in November, on a trip into Cheshire and the back end of Greater Manchester. I also saw TV Funnyman Les Dennis on the platform at Wilmslow station, briefly giving the blog an aura of showbiz glamour it sadly couldn't maintain. This just happened. In fact, this month is still happening. Do you need me to go over it again? Mormons in Chorley, pigeons in Sheffield, public toilets in suburbs. I've yet to hear from Merseyrail about my proposals for the new trains, but I assume it's just a matter of time. And that was that. Twelve fairly exciting months. I'll do one more blog post with all the number crunching for this year, stations visited, tea drunk, that sort of thing, and then it'll be 2014 and we can forget all about it. Hurrah!